Farid Adjazairi is a singer, songwriter and Arabic lute (oud) & guitar player from Algeria, North Africa, now living in London. He sings in his native Kabylian and Arabic languages blended with French. 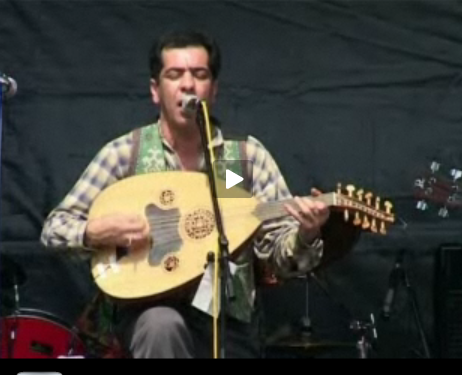 Farid’s main music is Rai 'n' Kabylian Berber Music (Algerian folk-soukous Music) with its impassioned singing and heady rhythms. Farid Adjazairi is a singer, songwriter and Arabic lute (oud) & guitar player from Algeria, North Africa, now living in London. He sings in his native Kabylian and Arabic languages blended with French. Farid’s main music is Rai ‘n’ Kabylian Berber Music (Algerian folk-soukous Music) with its impassioned singing and heady rhythms. The African, European, Asian and oriental musical influences are fused to create a colourful and entertaining style. The music is percussive and expressive, exciting and energetic and is great for dancing to. Belly dancers can be added to the show if required building on the six piece core band of lute, guitar, keyboard, bass, drum kit, derbouka, djembe and congas. Farid has performed at small and popular venues such as The Forum (Kentish Town), Astoria (London), Momo restaurant (London), Samuel Pepy’s pub (Hackney), Bar Lorca (Stoke Newington), BBC world service English and Arabic Music Directory, BRTV Berber Radio Television (France), Anda de Bridge Bar restaurant (Shoreditch), Conway Hall (Holborn), The Wine Cellar (Woolwich), Numidie Bar Restaurant (Crystal Palace), School of Oriental and African Studies (London), The Artesian Well (Wandsworth Road), Merton Abbey Mills, museums, art galleries, schools, and at many other events and festivals.